What a good feeling to be back home in Paraguay after fourteen months in the US, mostly traveling around. We flew back into Asunción on August 4th and got back to Escobar as soon as possible to find our house and our dog Oso wonderfully cared for by Antonio and Lida Guerrero. Before we went back to Escobar I went to our cell phone provider to get a phone that I could use, as I was using our Motorola V3 before, to connect to the internet. The salesman talked me into buying a BlackBerry, saying not only could I get email and browse the web using the phone but I could also use the phone as a Bluetooth modem to connect my laptop to the internet as I had done with my other phone. Well, salesmen are salesmen everywhere, I guess, and this guy somewhat exaggerated the capabilities of the BlackBerry which, though a good phone and very useful for brief emails and a little internet browsing, is not good at all as a Bluetooth modem. The upside of that is I've been wasting no time at all online. The downside is that some things I really need to do online--paying bills, for example, or updating my blog--I just can't do. Part of the problem is a very variable cell phone signal at our house. This aspect of the problem I'm hoping to remedy with a dual band cell phone repeater. But there also seems to be a problem with the phone itself as a modem--even when I have a good signal it only connects a fraction of the times I try. That's the frustrating side of life. The exciting part of our life is helping missionaries with language learning, and I just finished this week a four-week refresher course with SIM missionaries Jeff and Amy McKissick, who have also just returned from the US. They are super committed to ongoing Guarani language learning and it's always a delight to work with them. Check out Amy's post on their language-learning experience. Right now we have a couple of days in Asunción. We're celebrating Timmy's fourth birthday today, and tomorrow we'll go back to Escobar and take with us Lizet's mom who is here for a visit from Bolivia. We're staying at the mission guest house, where we have a wireless internet connection, so I'm trying to remember and catch up with all the things I need to do online. 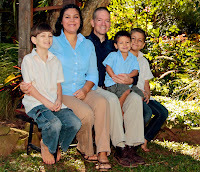 I keep reminding myself that to get to live in such a wonderful place as Escobar, and be involved in the exciting ministry we get to have a part in, we have to make some sacrifices, and if one of them is a reliable internet connection, well, then, so be it! It's well worth it. Welcome back friends! May God grant you grace as you transition back to the culture and its technological frustrations. How can I learn Guaraní? I am a fluent Spanish speaker, so could use Spanish didactical materials if I knew where to get them. Thank you for your advice! "There is a series available in Paraguay, but nowhere else as far as I can tell, called "Hablemos el Guaraní," by Diego Ortiz, et. al. It consists of four books. The organization leaves quite a bit to be desired, and the explanations are sketchy. But it's the best thing I've found. "There are a couple of good dictionaries available, but the one I like the most for beginners is by Natalia Krivoshein de Canese. Though it is smaller than the very thorough volume by Antonio Guasch, it contains a higher percentage of vocabulary that is in current popular usage. This frees you from the blank looks resulting from choosing an obscure, obsolete, or invented word, of which there are many in Guasch." I should mention, Angela, that the Ortiz series also has, I believe, recordings. Are you in Paraguay? If so, you should be able to find these in one of the larger bookstores. I wish you well in your efforts to learn Guarani!